I while back- O.K., it was February- I did a little giveaway. Problem is, although a winner was chosen and notified I have yet to send her the goodies I promised. I hope you can relate. Being a mother is hard, and although I am doing all kinds of things, I am also having trouble doing a whole lot of others. Better late than never the saying goes, so here is what Jena B. is getting. A bar of Theo chocolate. I found this chocolate at the Mother Earth News Fair in Lawrence, Kan. last Spring. The company had a booth and they were giving away lots of samples. I got to try several of their bars, including some pretty wild flavor combinations. This is a pretty tame one, but I love the salty-sweet combo. One more thing to love about Theo is that they use organic, fair trade cocoa beans. Two Lake Champlain chocolate squares. 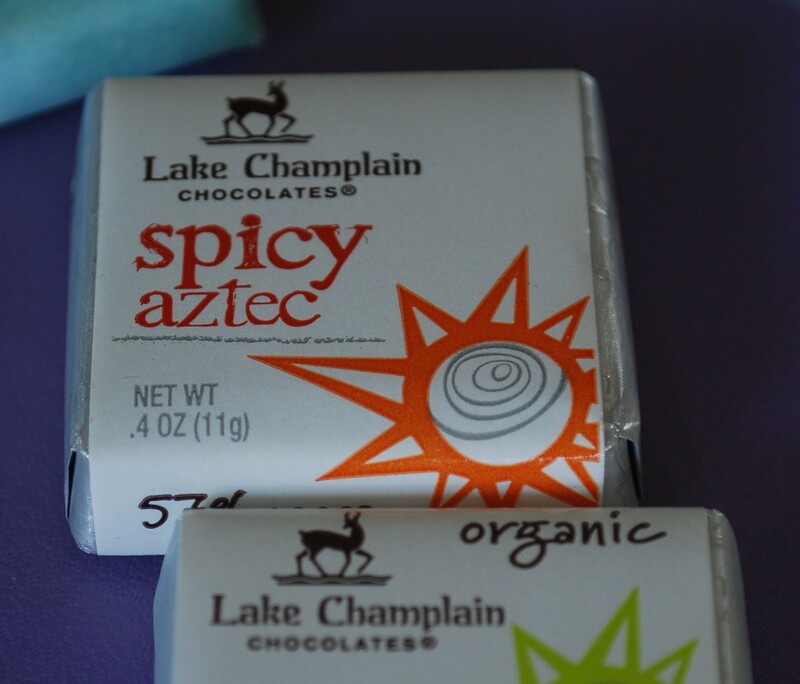 I have enjoyed Lake Champlain chocolates for a while now, but I love the guilt-free, take-anywhere size of these squares. They are great to have in your purse, although any chocolate that is around me will not make it long enough to be put away in a purse. These squares are also organic and fair trade. 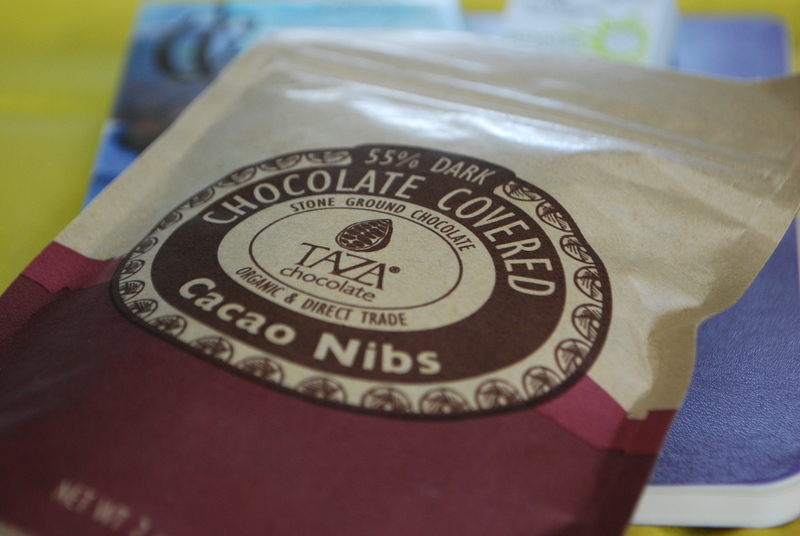 A bag of Taza Chocolate Chocolate-covered Cacao Nibs. 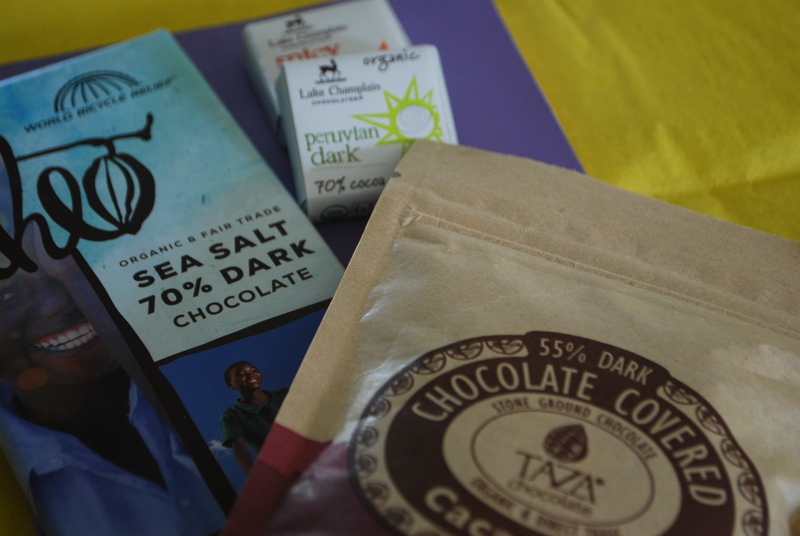 I got to know Taza Chocolate through its amazing chocolate disks. These cacao nibs are addictive and have the benefit of giving you all of the good properties of cacao beans, including having loads of antioxidants. Cacao is supposed to improve your mood and these nibs covered in chocolate definitely do. A couple of small Moleskine journals. The smaller size make them perfect for carrying in your purse without adding any weight. I love to have something to jot down thoughts, tasks and ideas. You can do this on your smart phone, but it is definitely not the same. I was hoping to get Jenna a pair of them in red, her favorite color, but I couldn’t find them, so I got her the dark blue ones. Jenna, I hope you enjoy your gift. I promise that the next giveaway will have a much quicker turn-around. By the way, we are not being compensated for any of these mini-reviews, but if anyone wants to pay me- even if it is in chocolate- I will take it. If you want to know more about Jenna, read her guest post here. Just to clarify, she won the give-away fair and square, not because she had written a guest post. These chocolates look amazing and they are organic, double points!! Do you order them online or purchase them from a local shop? Hi Sasha, I just moved to a much larger city than where I lived before and I have been able to find them at my local grocery store- a small chain. 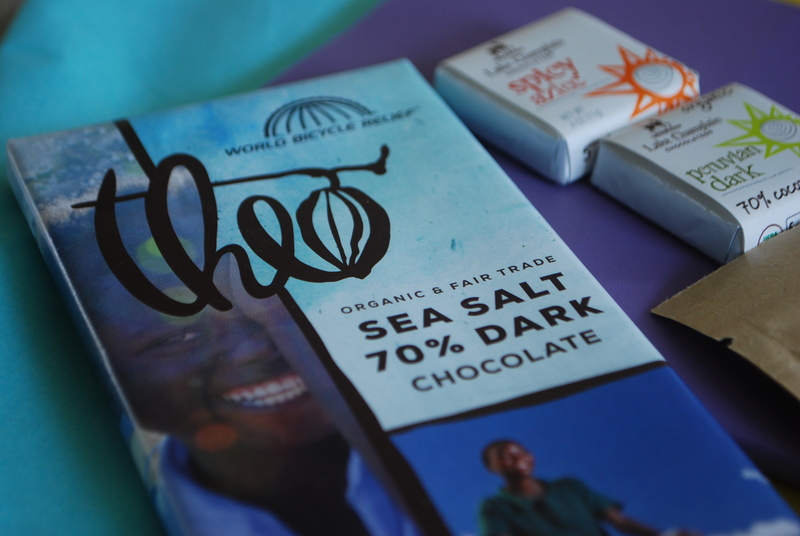 Whole Foods Market sells Theo Chocolate and Lake Champlain products. Taza is a bit harder to find, but they do sell online.